When Andy Lee announced his retirement in early 2018, he was asked how he’d like to be remembered. “An an honest boxer,” came his reply. “A fighter’s personality reflects in their boxing style, and if nothing else I was honest.” It seems the adage extends to a fighter’s memoir, too. Lee’s autobiography Fighter, written with Niall Kelly, is a candid reflection on a life in the sweet science. Glossy pages of the book show photographs of Andy’s life and career, and the chubby youngster pictured is almost unrecognizable from the 6’2”, lanky world champion he will become. Born to Irish Traveller parents in London, Lee’s boxing story begins from play fighting (and bloody, not-so-playful fighting) with his brothers. At age eight, he begins training at Repton Boxing Club. Lee had his hand raised often, even as a young boxer. “As a kid, I never wanted to be a world champion,” Lee writes. “I just didn’t want to let anybody down.” Quickly, we see his evolution from kid brother trying to keep up, into a talented, hungry athlete. As he continues to add to an already impressive amateur resume, we see Andy’s account of the phone call that changed the course of his career. Famed champion-maker Emanuel Steward hears of Lee’s recent tournament victory and calls the teenager at home with a proposal: come train with him at Detroit’s Kronk Gym and sign a professional contract. Young and unsavvy in business, Lee respectfully declines, citing his focus on the upcoming Olympic Games in Athens. Following a devastating, medalless Olympic defeat to Alfredo Angulo, Andy begins to imagine what’s next. Courted by the Irish national team and American investors, Lee reflects (not for the last time) on how to make impossible business decisions with a boxing career. At this early stage, he’s built a team of trusted friends and advisors, and takes a leap of faith. As the Limerick chapters come to an end, we find Andy in Detroit, with Steward’s sights set on making him a world champion. The Detroit section of the book reads how it must have felt to experience: a quick rollercoaster with too many twists and unseen obstacles to count. Andy acclimates quickly to his life at Kronk Gym; he moves into Emanuel Steward’s home and the relationship with his new coach quickly evolves into something that resembles a familial love and respectful mentorship. We see Andy’s full, but sometimes lonely life in Detroit. We see his boxing sharpen. We see training camps and fights and victories and opportunities… and then we see his first loss. The devastating play-by-play of defeat by Brian Vera reads like it’s been on repeat in Andy’s mind ever since. Throughout Fighter, the authors dive deep into each loss… like any good champion, Andy obsesses over them, tries to pinpoint where he went wrong. These chapters don’t read like excuses, but rather, a thorough account of how to avoid the same mistakes in future battles. As Lee prepares for a comeback, we see him navigate the business of boxing and the treacherous management of an athlete’s career; there’s an omnipresent pressure from Lee’s investors trying to get their money’s worth. Losses in Fighter aren’t limited to boxing matches; Lee recounts family and close friends who pass away during his career, including the death of longtime trainer Emanuel Steward. The Detroit section of the book ends with Andy sad, grateful, and at yet another decision point: who will he train with in the next chapter of his career? In London, he sets up with trainer Adam Booth and after a short adjustment period, the new team launches into what will become the final fights of Lee’s professional boxing career. Quickly, we find Andy center ring at the Cosmopolitan in Las Vegas, as he prepares to fight Matt Korobov for the WBO middleweight title. Lee wins in a sixth round stoppage. The chapter is a thrilling account of what it’s like to realize a lifelong dream. True to Irish literary tradition, Fighter is lyrical and thoughtful; the book is about so much more than it seems on the surface. It’s an enjoyable read because it’s the tale of an underdog fighting his way to the top… but it’s also an inside look at how modern boxing works, the business of it all. Fighter reinforces what many fight fans already know about Andy Lee: he’s likeable (what’s not to love about a bloke who wears track pants to a concert, surrounded by tuxedos?) and his humility is unmatched (“One punch won it for me tonight, and one punch could end it all just as quickly the next time”). There’s a kindness in the way Lee speaks of his sport and fellow athletes, but this doesn’t detract from his ferocity or commitment to it. On the final pages, we’re left with the sense that his work ethic is somehow contagious; above all, Fighter is the kind of book that makes you want to work harder, to master your craft, whatever it may be. For the past 30 years, there has been no debate that Evander Holyfield is the greatest cruiserweight of all time. That was until Oleksandr Usyk wrapped up his 2018 in-ring campaign. The 31-year old southpaw from Ukraine hasn’t enjoyed the benefit of fighting at home since his final fight as a contender in Dec. ‘15. Each of his last eight starts have taken place on the road, all but one being staged in the home country of his opponent beginning with his title-lifting effort over then-unbeaten champ Krzysztof Glowacki in Sept. ’16 in Poland. Fighting on the road is hardly a new experience for the gifted cruiserweight, who spent a healthy portion of his 350-fight amateur career away from his native Ukraine. Included among the lot were two Olympic tours, advancing to the quarterfinals of the 2008 Beijing Olympics and capturing a Gold medal during the 2012 London festivities. It’s only fitting that every championship he’s won as a pro has come against the backdrop of a partisan crowd. In 2018, Usyk (16-0, 12KOs) entered the lion’s den three times—twice in unification bouts and wrapping up the year with a defense versus a former champ, all taking place in sold-out arenas in packed with his opponent’s fans rooting hard for a hometown win. His journey began with a trip to Riga, Latvia last January to face then-unbeaten titlist and local hero Mairis Briedis. It was already his third time facing an undefeated opponent in their home country, as he was the first to beat Glowacki (in Poland) and American contender Michael Hunter in the United States. In Briedis, Usyk would receive his stiffest test as a pro, certainly a far more difficult challenge than having stopped former titlist Marco Huck in Germany the prior September in the opening round of the World Boxing Super Series cruiserweight tournament. The first five rounds were anything but a clear-cut indicator that Usyk would even win, much less go on to enjoy a Fighter of the Year-worthy campaign. He first had to adapt to the brisk pace forced by the house favorite, then contend with a clash of heads in the 5th round which left him briefly wobbled and with reddening around his left eye. It ultimately served as a wake-up call. Usyk took over the fight once the second half began, his second-to-none conditioning carrying him to victory. Save for a minor scare in round nine and a final round last-ditch rally by Briedis, the second half surge was enough for the visiting Ukrainian to advance to the WBSS finals. That led to his twice traveling to Russia: first to take in the other semifinals bout between Murat Gassiev and Yunier Dorticos one week later; then in July, for his finals meet with Gassiev in a bout that would leave the winner as the first truly undisputed cruiserweight champion in the four-belt era. As it turned out, the hardest part in making history was getting to fight night. The unification clash itself was delayed by more than two months due to Usyk requiring elbow surgery, thus killing plans for a May clash in Saudi Arabia. The postponement worked out in Gassiev’s favor, in that the fight was relocated to his native Russia. Home country advantage was the only edge he’d enjoy that night. Usyk quickly took the crowd out of the equation, somehow reducing an undisputed cruiserweight championship contest into a one-sided sparring session in pitching a virtual shutout. Even before the final decision was announced, the immediate question was what the newly crowned World cruiserweight king would do for an encore. The answer? A third road trip on the year, of course. For months, the idea was floated of Tony Bellew challenging the WBSS winner—particularly if it was Usyk, who even entered a co-promotional pact with the Brit’s promoter Eddie Hearn. The union led to the finalization of plans for a November 11 clash in what would be a sold-out Manchester Arena in Manchester, England. Even if Usyk opted to sit out the rest of 2018 following his win over Gassiev, he’d still serve as a leading Fighter of the Year contender. For much of the first half of his clash with Bellew, the risk of a third fight in an optional defense seemed to outweigh the reward. That was, until the defending champ was ready to take over. Once again displaying his superior ring smarts and conditioning, Usyk overcame a rocky start—and surprising scorecard deficit—to emphatically knock out Bellew in round eight. A textbook left hand landed flush, putting the former cruiserweight titlist down and out, a knockout loser in what would be the final fight of his celebrated career. As for Usyk, it was merely the final moment of an unrivaled 2018 in-ring campaign. He entered the year at least a distant second in discussions of the best active cruiserweight of all time (Holyfield) and the best active boxer from Ukraine (Vasiliy Lomachenko). Answers that were once foregone conclusions now warrant considerable discussion. 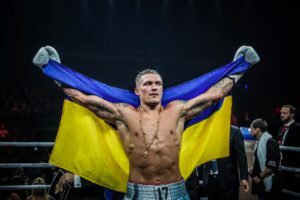 Everything about the year that was for Usyk changed that mindset—while fittingly also ending any debate as to whether anyone else deserved the honor of being named the BoxingInsider.com 2018 Fighter of the Year. Is Vasyl “Hi-Tech” Lomachenko 2017 Fighter of the Year? 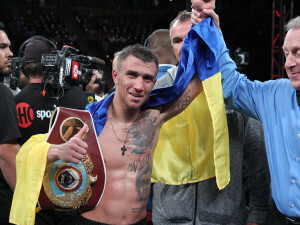 The two-time Olympic Gold Medalist Ukranian Vasyl “Hi-Tech” Lomachenko, 10-1, living in Oxnard, CA, moved up from holding the WBO Featherweight title to defeating WBO World Super featherweight Roman Martinez in June of 2016, and defeating in his first defense the former WBA Super World featherweight champion Jamaican Nicholas “Axe Man” Walters, 26-0-1 by stoppage in 7 rounds. In Lomchenko’s second defense in 2017 in April defeated WBA World Super featherweight champion (his title not at stake) Jason “El Canito” Sosa, 20-1-4, of Camden, NJ, stopping him in the 9th round at the MGM National Harbor, in Oxon Hill, MD, stopping Sosa’s 17 fight winning streak. In Lomachenko’s third defense in August he stopped Colombian Miguel Marriaga, 25-2, in the 7th round, at the Microsoft Theater, in Los Angeles, CA. In December Lomachenko in his fourth defense stopped the former two-time Olympic Gold Medalist, WBO World Super bantamweight and WBA Super World bantamweight champion Cuban Guillermo “The Jackal” Rigondeaux, 17-0, in the 6th round. Lomachenko was 396-1 in the amateurs while Rigondeaux was 463-12. This was a major event having a pair of two-time Olympic Gold Medalists meeting one another. Lomachenko is now considering seeking moving up the lightweight to gain his third division world title. Egis Klimas is his manager who also has WBO light heavyweight champion Sergey “Krusher” Kovalev, of Russia, living in Ft. Lauderdale, FL, among many other boxers and promoted by Top Rank. Another considered for “Fighter of the Year” was Anthony “A.J.” Joshua, 20-0, in April, defending his WBA Super world heavyweight title stopping former Super World heavyweight champion Wladimir Klitschko, 64-4, and stopping Carlos Takam, 35-3-1, in a not too impressive defense. Also considered was IBF, WBA and WBC middleweight Gennady “GGG” Golovkin, 37-0-1, of KAZ, living in L.A. who in March defeated former WBA World Middleweight champion Danny “Miracle Man” Jacobs, 32-1, at Madison Square Garden, in NY and in September getting robbed being held to a split decision draw by former WBO World Super welterweight champion Saul “Canelo” Alvarez, 49-1-1, at the T-Mobile Arena, in Las Vegas, NV. Is Vasyl Lomachenko the Smartest Fighter since Mayweather? That’s a really interesting comment, for Berto puts his finger on the combination of physical skill and relentless mental acuity that made Mayweather so formidable in the ring. In a sense, Mayweather’s defense-first style is like being two or three steps ahead of his opponent at all times. 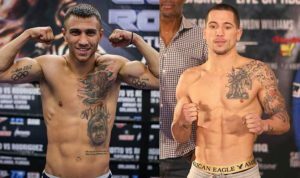 Fast forward to this Saturday night, and fans have the opportunity to see another hyper-skilled boxer in action as Vasyl “Hi Tech” Lomachenko (7-1, 5 KOs) takes on Jason Sosa (21-1-4, 15 KOs) in the main event of the HBO card from MGM National Harbor in Maryland. Rated highly on many observers’ pound-for-pound list, the former Ukrainian Olympian gold medalist is a special talent. He combines tremendous hand speed with balletic footwork and relentless offensive pressure. Lomachenko shifts angles and constantly adjusts distance, leaving some opponents baffled and disoriented. This is certainly what happened to Nicholas Walters in their bout last November in Las Vegas. Walters is no tomato can; he’s a tough, hard-hitting, and dangerous fighter. But after sevens rounds with “Hi Tech,” he quit on his stool, physically battered and mentally defeated. Like Mayweather, Lomachenko seems to see the fight in slow motion and be in places (and set up angles) that his opponent can’t see and can’t predict. Will he put on another master class on Saturday night? Or will Sosa take a page out of Orlando Solido’s playbook, and take the fight into the gutter? Solido (who was over weight in the bout) inflicted a split-decision loss on Lomachenko in the Ukrainian’s second professional fight, back in 2013. “Hi Tech” learned a good deal from that bout, including how to be more offensive against a fighter who wants to slow the action. Saturday night, Lomachenko has an opportunity to show that he deserves to be considered one of the best pound-for-pound in the sport, and one of the smartest fighters in the game. 2016 Fighter of the Year Anyone But Andre Ward! In looking over the new and defending world champions WBC/WBO super lightweight champion Terence Crawford, 30-0 (21), out of Omaha, NEB, was 3-0 with a pair of ko’s in 2016. The only other “champion” with 3 fights was Andre Ward who won a disputed decision over Sergey Kovalev who also had 3 fights. A fair decision and Kovalev would be a shoo-in for Fighter of the Year. This should never get “Fight of the Year” for Kovalev got hugged more (46x) by Ward then he does by his wife. IBF super welterweight champion Jermall Charlo, 25-0 (19), out of Houston was 2-0 winning a close decision over former champion Austin Trout and stopping previously unbeaten Julian “J-Roc” Williams. New WBC Super flyweight champion Roman Gonzalez, 46-0 (38), of NIC, had his toughest fight of his career stepping up a division winning a hard fought decision. He was 2-0. Gennady “GGG” Golovkin, 36-0 (33), holding the WBA, WBC and IBF middleweight titles stopped a pair of unbeaten boxers with records of 36-0 and 18-0 to expend his knockout streak to 23. In the cruiserweight division there were 3 new champions. Tony “Bomber” Bellew, 28-2-1 (18), won the vacant WBC title and was 2-0. Murat “Iron” Gassiev, 24-0 (17), of Russia, won the IBF title over Denis Lebedev who didn’t have his WBA title on the line. Oleksandr Usyk, 11-0 (10), of UKR, won the WBO title and went 2-0. Saul “Canelo” Alvarez, 48-1-1 (34), the WBC/WBO Super welterweight champion went 2-0 but pushed back his bout with GGG a year. Okay, first things first – there’s something a bit misleading about the title of this article. The truth is that I don’t have a FIGHTER OF THE YEAR, per se. Indeed, you won’t find me listing the greatest fights, fighters, knockouts, and whatever else here at Boxing Insider. Not that I mind writers bestowing such honors. To the contrary, I often find the whole exercise fascinating. Again, though, you won’t see me engaging in it here – at least not this year. Still, I don’t feel Carl Frampton is worthy of the honor anywhere – even though I like the guy. There’s no doubt the Irishman has had a hell of a year for himself. First, he defeated Scott Quigg for various superbantmweight titles last winter. Then , in a terrific display, the 22-0 slugger went on to defeat fellow undefeated pugilist – and WBA super world featherweight champion – Leo Santa Cruz under the bright lights of Brooklyn. Furthermore, Frampton is now set to face off against Santa Cruz again, this time in Vegas, next month. And, as a cherry to place atop the sundae, Frampton also comes across as a polite and likeable guy. To be sure, there isn’t much not to like. Still, I can’t think of Frampton without the name of one Guillermo Rigondeaux popping into my head. To be sure, Frampton and superbantamweight Rigondeaux now operate at different weight classes. That wasn’t always the case, though. Indeed, there has been interest in having the two men meet over the years. Sadly, however, team Frampton clearly wants nothing to do with the Cuban stylist. Indeed, Sky Sports quoted Frampton’s manager, Barry McGuigan, last March referring to Guillermo as “negative.” Uh-huh. “What do we gain by fighting him?” McGuigan asked. Perhaps not much more than a loss, Barry. Rigondeaux is exceedingly skilled, after all. Still, ducking one of the world’s top talents shouldn’t be taken lightly. Yes, Rigondeaux can be boring and no he hasn’t endeared himself to a strong fan base. What’s more, Rigondeaux may cause Frampton to lose out on future pay days, should he make Frampton look bad. Make no mistake about it, avoiding Rigondeaux is understandable, especially when one is repeatedly willing to face the likes of Santa Cruz, as Frampton is. Yet there are consequences for such actions, as well. At least there should be. There’s no doubt that Frampton is an impressive talent. It should not be forgotten, however, that he has avoided a perhaps even greater talent on his way to earning accolades. An interesting article appeared in this publication the other day wherein Matthew N. Becher ran through a list of top candidates for 2016s Fighter of the Year. All candidates were worthy, but I won’t focus here on which one I felt was the years’ very best. I simply want to focus on one of the fighters mentioned – Manny Pacquiao. For, believe it or not, Pacquiao remained dominant in 2016. Just how dominant? Well, he bested potential Hall of Famer Tim Bradley – for the second or third time in a row, depending on how you look at things – then made easy work of rising star Jessie Vargas later in the year. This, frankly, requires a degree of reflection. For, let’s face it, many if not most fight fans want the Mayweather-Pacquiao era to be over. Sure, they’d pay a ton to see Manny and Floyd go at it again, or even Floyd and white mainstream media fave, Conor McGregor of the UFC (I disdain political correctness, but let’s face it, if McGregor weren’t Caucasian there would be collective head shaking at his behavior rather than winks and smiles). Still and all, people are tired of Floyd and Manny being the faces of the sport. Here’s the thing, though – Manny doesn’t seem to be going anywhere. Here’s something else – the man is still dominant. I can’t say with any certainty that there’s a welterweight or junior welterweight out there who can beat the guy. His pay per view numbers may be down, he may not be what he was, but man, Pacquiao is still something else. To be sure, he still seems to puzzle his opposition, just has he has for ages now. This ability to confuse has been evident with every major opponent he’s faced in the past eight years or so with the exception of Floyd. Furthermore, the Filipino icon remains in great shape, even for his advancing age. Make no mistake about it, boxing is in a transition period. Old names like Bernard Hopkins are leaving and new names like Vasyl Lomachenko and Bud Crawford are stepping up to the plate. A fighter who is still in top competitive form, however, can’t simply be rushed off the stage. 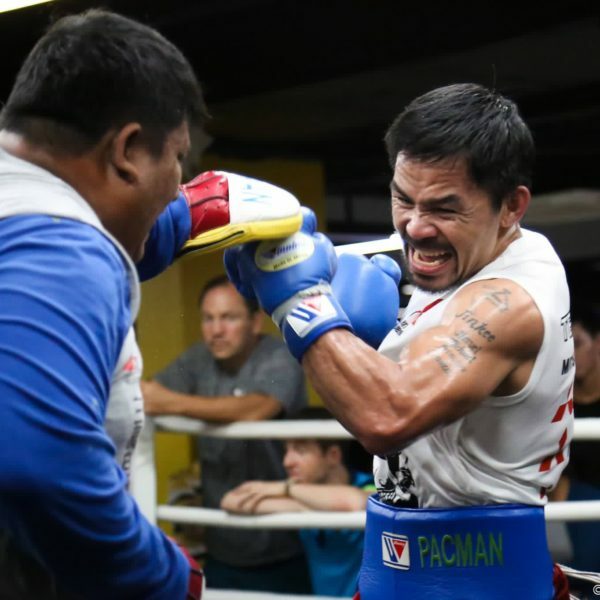 Up and comers like Crawford and perhaps Errol Spence Jr may indeed be able to best Pacquiao, but that’s no guarantee – not even at this late stage of Pacquiao’s career. Like many others, I want to move on from the Manny-Floyd era. If this year convinced me of anything, though, it’s that Pacquiao is going to stick around for a bit longer. And at the moment at least, there’s no guarantee anyone can do anything about it. 2016’s Fighter of the Year is? ​Another boxing calendar is coming to an end and that means year end award conversations are taking place. In a year that has seen a lot of craziness, from PED use at an all-time high, to the Heavyweight champion being stripped of his belts, a year with 0 Floyd Mayweather Jr. fights and sharp decline in the Pay per view format, 2016 did still have a number of great boxers deserving of the title “Fighter of the year”. Here are a few who may have had what it took. ​Manny Pacquiao: Pacquiao started the year off in April by taking on pound for pound lister and all around top welterweight challenger Timothy Bradley Jr. in what would be their rubber match. Pacquiao announced it would be his final fight in his hall of fame caliber career and that he would retire after the fight, win or lose. Pacquiao entered the fight as an underdog, since he would be coming off nearly a year layoff after his loss to Floyd Mayweather Jr. and a shoulder surgery that followed. Pacquiao not only beat father time in this fight, but he beat Timothy Bradley as sure handedly as he ever has. He was able to knock Bradley down twice in the fight, and won by Unanimous Decision. After deciding rather quickly that he couldn’t stay away from the sport he loved for very long, Pacquiao then targeted the WBO Welterweight champion Jessie Vargas. Vargas who only has one loss in his career to Tim Bradley Jr. had the age advantage but nothing else. Again Pacquiao became a world champion and with 59 wins in his career, it seems that he is ready to attempt to get number 60 early next year against, hopefully a high quality opponent. ​Andrew Ward: Ward is on the list mainly because of the win against Sergey Kovalev last month. He fought 3 times in 2016, which is the most active he has been since 2009. The opponents he defeated, Sullivan Barrera, Alexander Brand and Sergey Kovalev rank from unknown to contender to one of the very best fighters in the sport. Ward is on the list, again, solely for the fact that he had a win over Sergey Kovalev and became the Unified Light Heavyweight champion. Regardless of controversy on the scorecards, he beat an undefeated, top 5 pound for pound champion. He will receive votes, but may be a longshot to actually win the award. ​Joe Smith Jr.: Smith is a late addition after last weekend’s win over Bernard Hopkins. Sure, he beat a 51 year old Hopkins, but he is still the first person to ever knock Hopkins out and the way he did so was impressive to say the least. This was Smith’s third win of the year, with an April TKO of Fabiano Pena and a follow up first round KO over Andrzej Fonfara, which is a very heavy favorite for upset of the year. Smith fought two marquee fights in which he was the underdog and winning both of them by show stopping Knock outs. ​Terrence Crawford: Crawford will try to follow up his 2014 FOTY award with another ceremony this year. Crawford fought three times in 2016. He knocked out Hank Lundy at the Theater in Madison Square Garden and then unified the division against the top Jr. Welterweight, Viktor Postol. Though the fight did not do great pay per view wise, and was deemed a boring fight, Crawford displayed talent that showed why he is one of the best fighters in the world, completely unarming the very tough and until then, undefeated, Postol. Crawford ended the year back home in Omaha, against a C-level opposition in John Molina Jr., who did not put up much of a fight and Crawford outmatched in every single category. Terrence Crawford will be a Fighter of the Year finalist for many years to come. ​Carl Frampton: Carl Frampton is a very big favorite to win the BWAA Fighter of the year award for 2016. Frampton fought twice, both against undefeated fighters, Scott Quigg in Manchester and Leo Santa Cruz in Brooklyn. Frampton beat Quigg by Split Decision to unify the Jr. Featherweight division and ended up breaking Quigg’s jaw in the process. 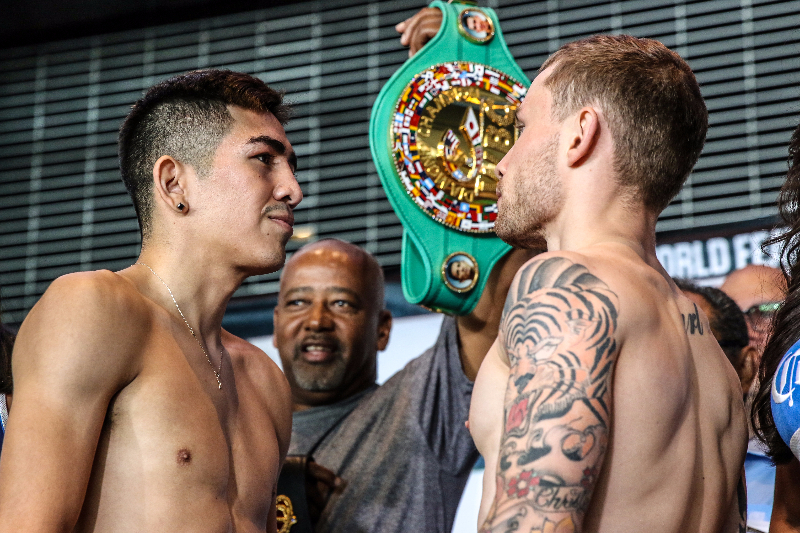 Five months later, Frampton decided to move up in weight to take on the WBA Featherweight champion Leo Santa Cruz, and in what many may say was a “Fight of the Year” candidate, was able to defeat the hard nose Santa Cruz. Frampton became a two division champ in 2016, already has scheduled a rematch with Santa Cruz for January 28th in Las Vegas and looks like a man who is ready to take on the toughest guys he can. ​Vasyl Lomachenko: Lomo fought twice this year, the 7th and 8th fights of his career. The first fight was against the very tough Rocky Martinez at the Theatre in Madison Square Garden. Lomachenko made easy work of Martinez with a “Knockout of the Year” candidate performance. Martinez had only been knocked out 1 time in his career and that was to a young, prime Mikey Garcia, some good company for Vasyl to be a part of. This win would make Lomachenko a 2 division world champion in only 7 professional fights, which is extremely impressive. He followed that win up with the highly anticipated showdown against undefeated former champion Nicholas Walters. Not only did Lomachenko put on a display of overall boxing brilliance, he made Nicholas Walters, one of the top fighters, if not the top in the division say “No Mas”. Going into the ring and completely beating a man is one thing, but to make a top level fighter quit is something else. Lomachenko is taking the boxing world by storm, and who knows what is next for the 2x Olympic Gold Champion. As Glen Tapia glared the referee in the eyes, trying to bargain for the chance to repent for the knockdown he just experienced, Freddie Roach cut him off. Standing on the apron of the ring, Tapia’s trainers had seen enough. 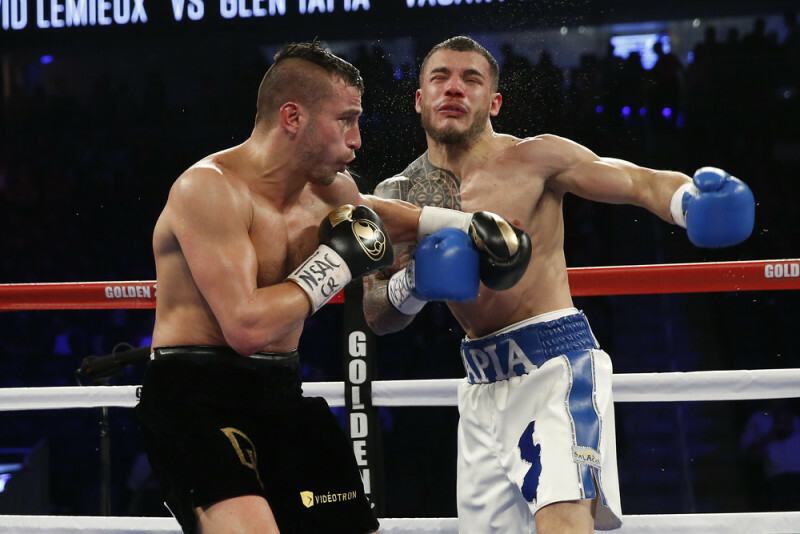 Four vicious rounds Saturday night with cement-fisted David Lemieux – rounds where Tapia’s face was repetitively imprinted with power shots – were enough to pull the plug on the night for the New Jersey product. A question popped into my mind in the aftermath following this blowout, and it wasn’t whether the fight should have been stopped. While Tapia looked physically alert and game after the left hook that floored him, a look into his recent history might startle anyone who vouched for him to continue on. Take the fact that towards the end of 2013, he endured a scathing six rounds with rugged machine James Kirkland. Tapia’s corner was criticized that night for sending a shopworn fighter out two rounds too long until he was finished by a brutal assault that referee Steve Smoger couldn’t save him from, resulting in an ending that probably took a few years off of his life. Add that Tapia, during a brief guest appearance commenting on a night of local fights, noticeably slurred his words – though that could be chalked up to on-camera butterflies. Throw in that Tapia was knocked out in the bout before the Lemieux opportunity and it almost makes you wonder how Tapia was commissioned for Saturday in the first place. No, Tapia clearly expressed signs of slippage before his most recent defeat. My question was (and still is) how the sport as a whole – from fans to promoters to media – can align to save a man’s life before he realizes he’s lost it. Retirement is a sensitive subject with fighters. These are men predicated on pride in themselves and in every reason that wakes them up to train each morning. Boxing isn’t a cash-grab. To thrive, you have to be of a different breed, you have to translate the pain into pleasure. Many fighters self-inflate their egos as a coping mechanism against the immense dangers the sport presents. In this world of predators, even the slightest show of fear is devoured by those hungry for shine in boxing’s irreverent landscape. Simply put, you don’t mess around in this sport. Which makes it that much more crucial for fighters to know when to hang the gloves up and preserve their futures. The issue is exposing a fighter to his biggest opponent: himself. Confidence drives irrational risk-taking, and irrational risk-taking requires confidence. So how do we break this lethal cycle that damages long-term health and has even claimed lives? Let’s start from the top down. Boxing has long yearned for a national governing body to establish authority over the sport’s fractured practice. Imposition of strong health standards takes the decision out of the fighter’s hands. Instead of allowing fighters to find loopholes in medical decisions – such as fighting in Mexico where most commission suspensions are not recognized – a firm hand backed by scientific credibility is needed to prevent fighter pride, fan desire, and promoter financial interest from jeopardizing a man’s health. Yet if you’ve been around this sport long enough, you know that bringing together the sport’s key players is like organizing a family reunion where every relative despises each other. That brings us to promoters, managers, trainers, family members, and anyone else within a fighter’s camp. These people live with every move a fighter makes. They should know him best. That’s what makes their role so pivotal. For some, such as wives, parents, and siblings, prioritizing health over money is not an issue. These parties must be consistent in vocalizing the dangers of continuing a shattered career to said fighter, who may mentally block off these precautions to maintain the persona that keeps him in the ring. For promoters, managers, and trainers, monetary ties to a fighter can make it difficult to accept that a man’s time has come and gone. It is vital that dialogue begins early in that man’s career to set up a career after boxing. Many fighters enter the sport as their last resort for earning a living; this, however, is not an excuse for ignoring the reality that a revenue stream can end with just one punch. Additionally, ensuring that your line of work is not tied down to one boxer is crucial. Building young talent and ushering in a new generation ensures that the older generation doesn’t stick around longer than it needs to. Of course, the media’s impact on fighter safety is important as well. Publicizing bouts gives promotions more viewers. Tapia’s bout drew buzz as the co-main event of the night, yet many outlets pointed to how the match-up bolstered the card instead of how dangerous it was. Giving undue affirmation to a shot fighter to press on sadly solidifies the decision to remain in the sport. Even stories doubting one’s ability can inspire a fighter to break odds that were too high to overcome in the first place. So instead of simply publicizing a bout from the surface, dig deeper into backgrounds and resumes. Be bold and state if there’s a mismatch on the horizon. Even if it costs you a credential, shedding light on the snares of a particular match-up can encourage matchmakers to be considerate in putting together events. Fans have a role in this circus as well. There’s a saying as it applies to dating that there are plenty of fish in the sea. That same principle can be applied to our infatuation with fighters. Yes, cheering on your favorite warrior Saturday nights is great, but when the desire to see someone perform is put above that person’s best interest, we need to reevaluate whether we are contributing to boxing’s inherent problem. There will always be others who deserve the spotlight with much more to give the sport; champion these men. And be vocal; with social media, reaching athletes has never been easier. If a fighter hears from his own fans that he should retire, it may cause him to reevaluate his own condition. If that doesn’t work, remove the financial reward for endangering oneself. Don’t just be a cold-hearted consumer; speak with your dollars and support only fights with little risk to the combatants’ long term condition. All of this boils down to one word: transparency. Boxing could use transparency in nearly every facet of its operation, but no area desires honesty more than telling a fighter when it’s time to quit. Clouded by vested interests, boxing has made this decision much harder than it should be. Yet look at Muhammad Ali ail through the toughest stages of Parkinson’s disease. Read about Frankie Leal, a young fighter who lost his life in the ring because commissions were hamstrung and couldn’t enforce their suspensions on him in Mexico. These examples make it clear: we must watch this sport with a conscience and build an infrastructure that stops the damage before it’s dealt. Most fighters never want a fight to go to the scorecards, knowing the significant possibility of being robbed by corrupt judging. In similar fashion, we can’t allow a referee to be the one to make the call on a fighter’s career. We need to throw in the towel before the bell even rings.